This soft blanket is a must for traveling, the stadium, a picnic, or just relaxing at home. This blanket is just the perfect "Take me to the ballgame" item. 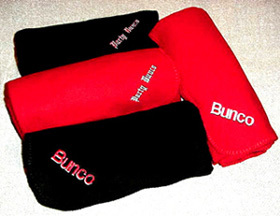 Embroidered with Bunco and made just for the Bunco enthusiast. Machine washable, lightweight, pill resistant, durable. 50" x 60" 100% Polyester Fleece.